We're glad you stopped by for a visit. 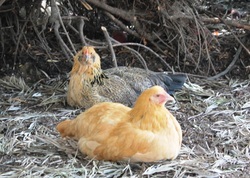 We are located in the Inland Empire in Southern California and are ready to meet your organic chicken feed supply needs. For those visiting this site from outside our proximity, please poke around & glean from the information provided here as well as links to other informative places. If you are in the High Desert/Apple Valley region of Southern California please visit Healing Throughout to order our feed for delivery to your area. May God bless you greatly in your adventures with chickens & all your pets & livestock & healthy eating for you & yours!